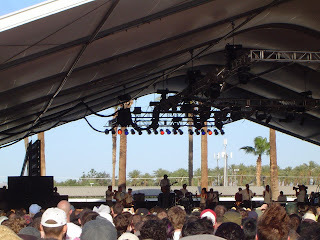 This was the one and only picture I took of Amy Winehouse back in April of 2007 while I was at Coachella. I was attending my second ever Coachella with my buddy, and suggested we swing through to see her. Her album 'Back to Black' had just been released here in the US in March of 2007, just a month before Coachella. She was playing the Gobi tent, which is by far the smallest tent at Coachella. As you can see from my picture however, we weren't even under the tent, as it was packed and impossible to get any closer. I actually joked to Mason that we should check out here performance because she's been known to perform drunk and get a bit out of control. It's pretty sad to think, that was 5 years ago and it only got worse from there. Here are some of the videos of her performance at Coachella 2007.